Fifty-eight years ago Neville Haynes recognized the need for communication in West Texas and filled out an application to the Motorola Corporation he found in a magazine. In answer to that application, coupled with Neville’s determination to serve the people of the Big Bend region, an FCC license was granted and in 1960 Big Bend Telephone Company was born.Justin V. Haynes is the third-generation owner of Big Bend Telephone Co. headquartered in Alpine, Texas. The ILEC service area is 17,594 square miles which is larger than nine states. We connect approximately .25 customers per square mile in areas with rocky, mountainous terrain with only twelve percent of the roads paved. Additionally the Company serves about twenty-five percent or 485 miles of the United States-Mexico border. 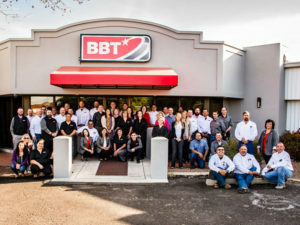 Big Bend Telephone’s affiliate, Big Bend Telecom, was established in 2005 and emerged as a competitive local exchange carrier in 2013. Through our CLEC we offer advanced services such as Broadband, VoIP, Hosted Voice Solutions, Metro Ethernet, Managed Network Services and more. We have expanded our service area to include Alpine, McCamey, Fort Stockton, Valentine, Fort Davis, Marathon, Marfa, Del Rio, Eagle Pass, Terminal and Uvalde. As our family of companies continue to evolve and change with the expectations and needs of our customers so does our name. BBT combines the past with the present and takes us into the future of communications. We have been the leading edge technology provider in the Trans Pecos area of Texas stemming from our origins of Basic Exchange Telephone Radio Service (BETRS) to our current fiber based advanced IP networks. BBT is proud to honor our heritage and continue to support and encourage economic growth and development in the communities we serve.